California native Addison Maye-Saxon is the very first brass player in Performance Today's Young Artist in Residence Program. 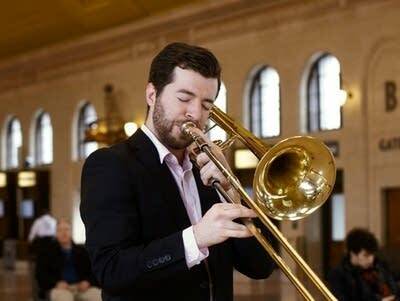 He is currently a student at the Curtis Institute of Music where he studies trombone with Nitzan Haroz, principal trombone of the Philadelphia Orchestra, and Matthew Vaughn, associate principal trombone of the Philadelphia Orchestra. Maye-Saxon started his musical life as a singer and played several instruments before beginning his study of the trombone at the age of 12. He won the Brass Competition during a fellowship with the Aspen Music Festival and School in 2017. Maye-Saxon is known for playing a wide range of music and having an expressive quality to his playing. He holds a Bachelor of Music degree from the Juilliard School and is an Albert M. Greenfield Fellow. Addison was accompanied by pianist Benjamin Krasner.